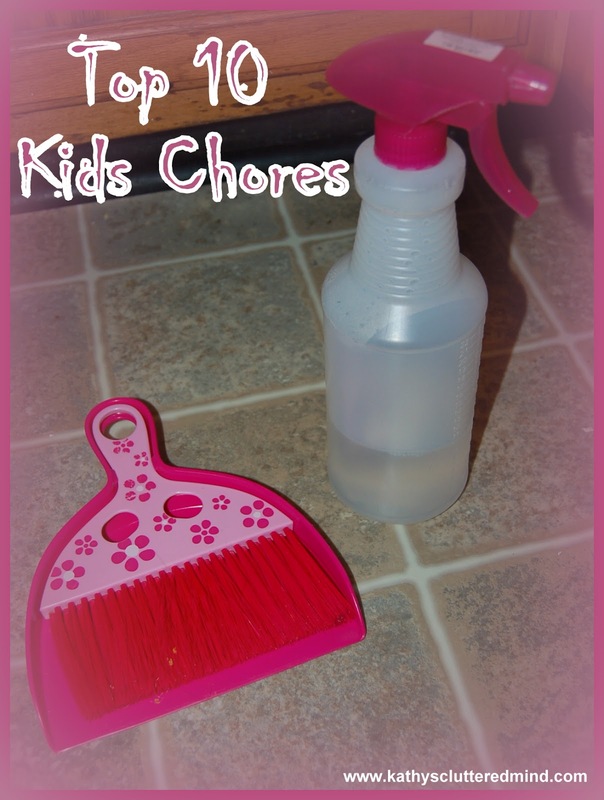 This week I want to share 10 Great Kids Chores. Saturday was the dreaded cleaning day. Since I woke up with an icky sinus infection I decided to enlist the kids help. Here is a list of 10 easy chores that we have our kids do to help out around the apartment. They do not get paid daily or weekly for these chores. They do them because they are part of the family and need to contribute. Occasionally though I will take them to Dollar Tree and let them pick out something as a thank you for helping out, good behavior, etc. 1) Fold their laundry and put it away. 2) Sweep the kitchen floor (I bought them a little dust pan from Dollar Tree that works great). 3) Clean their bathroom counter and mirror (we use vinegar so there is no worry about harsh cleaning chemicals). 5) Empty the various trash cans around the apartment. 6) Mop the kitchen floor (again we use vinegar). 7) Rinse off dishes and put them into the dishwasher. 10) Help take care of the family pets. Feeding, bathing, cleaning out cages, etc.